Sunshine, endless white sandy beaches and a huge variety of fun things to do: the Gold Coast has long been a holiday destination favourite, and with this deal, you'll get to experience the very best of it. Enjoy a six-day escape to The Island Gold Coast in a King or Twin Suite. 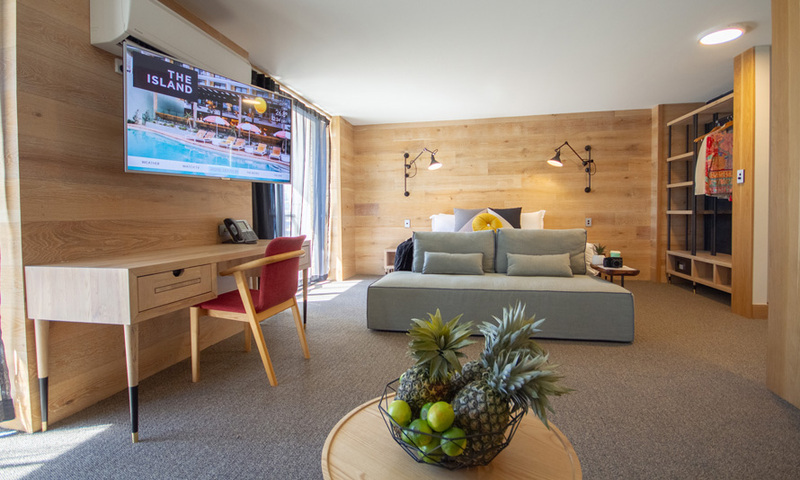 Book in for a couple's getaway, or bring the family along to lap up the coastal life at this freshly renovated, 4.5-star boutique hotel, located right in the heart of Surfer's Paradise. The choice is yours - relax on the stunning pool deck, eat at Goldies restaurant, sip cocktails on the Island Rooftop, or head out to nearby beaches, theme parks, rainforest walks and so much more. Enjoy return international flights, daily breakfast and even a cocktail on arrival! 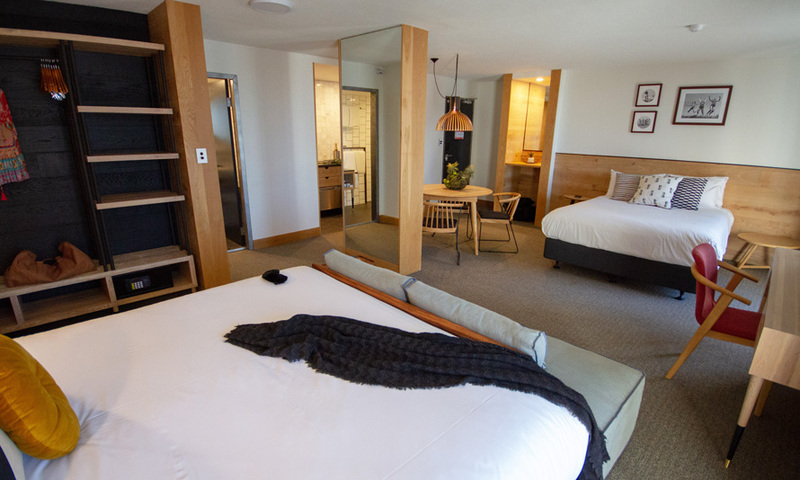 All Twin Suites feature oak wood styling and custom furniture leading out to a private balcony with views. Each room includes a luxury bathroom with an extra-large shower. All King Suites feature oak wood styling and custom furniture leading out to a private balcony with views. Each room includes a luxury bathroom with an extra-large shower. Meticulously designed and restored from head-to-toe, The Island’s renewed breath of life pays homage to the natural splendour of a Queensland seaside village with hardwood timbers, native plant life and open facades – bringing the outside, in! Enjoy a meal indoors or alfresco at the relaxing Island Pool Deck and Goldies or savour a classically crafted cocktail at the Island Rooftop. If you are looking for a boutique hotel stay, the Island Gold Coast sets the tone for an unforgettable experience. Today depart from Auckland for the sunny Gold Coast, Australia! Fly with award winning Air New Zealand or Virgin Australia (subject to availability). Upon arrival, find your own way to the hotel where you will spend the next 5 nights free at leisure. Enjoy today at leisure on the Gold Coast. Enjoy another day at leisure. Today at the appropriate time make your own way to Coolangatta Airport for your flight back to New Zealand. Please note: All additional charges are payable direct to your Travel Consultant in NZD (unless otherwise stated). Travel offer is valid for travel on selected dates until the 15th September 2019. This travel offer is priced for one, two, three or four people, depending on the option chosen. Dates/Months marked with an * incur a $75 flight high season surcharge per person. Virgin Australia & Air New Zealand plus any codeshare partners (subject to availability). Please note: One-way flights cannot be accommodated. Travellers must take all included flights within the package, and any flights intentionally forfeited will result in later flights being subject to cancellation. Please enquire directly with the hotel. Valid for children of all ages. - Cots/cribs are complimentary (subject to availability). - Children are classed as 0-11 years old. Please note: Not all inclusions are able to be offered to children as subject to the individual deal on offer. - Children 12 years and over are classed as adults. - Booking confirmation must be presented at check-in. - Dining inclusions do not include beverages (unless otherwise stated) and menu options are subject to change. - Strictly no refunds for this accommodation package for amendments and change of date. - Fees are at the resort’s discretion/policy. - Not valid in conjunction with any other offer or on existing reservations. - All activities and services are subject to availability. - Any unused portion of the package is non-refundable and cannot be exchanged for other services or cash. - Additional expenses such as (but not limited to) flights are not included with this accommodation package. - Package cannot be split. - Offer only available for consecutive nightly stays. - Once you have purchased your package and received confirmation your dates cannot be changed without contacting the hotel directly. This decision is strictly at the discretion of the hotel and subject to availability, so please ensure you have selected your intended travel dates. - Cancellations will forfeit voucher. after making your booking to cover you against cancellation. We will not be liable for any costs or losses incurred in the event that you cancel your booking. Any changes to your booking, including but not limited to departure date, tour length, passenger name/s, and flight ticketing requests, are subject to availability and may incur charges. Please refer to the Schedule of Fees at the end of this document for further details. All cancellations must be provided in writing/email by the person who holds the booking, this cancellation needs to be confirmed by an employee at TripADeal. Temperatures on the Gold Coast during spring range from 16 – 25°C with plenty of sunshine. Heading into the summer months the average increases to 21 – 28°C. Gratuities (tips) are not included in the deal price and are at the customer's discretion. A tourist visa is not required for Australia if travelling on a New Zealand passport. Please note: Passengers who are not New Zealand citizens must check with the respective consulate or visa agency to determine what their visa requirements are and what personal identification is required. It is also important to note, some areas of employment such as journalism, government authorities and charity organisations may have additional restrictions in applying for Visas. This may, in turn, affect the type of application required. - $50 NZD per change request post-purchase + any additional charges applied by the travel partners associated with the order. Please note: Inclusions are subject to the individual deal on offer. If selecting more than 2 adults and/or children, inclusions may differ. Please refer to Important Info for details. Before you go! Please tell us where you heard about us? Receive the latest deals, events & more!